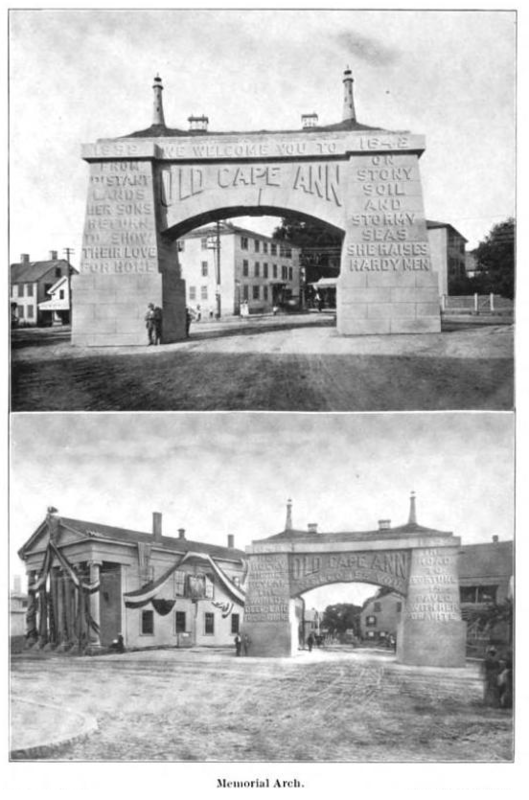 For the celebration of its 250th anniversary in 1892, Gloucester erected this memorial arch adjacent to the former town hall, now the American Legion building, on Washington St. The original plan called for two such arches, one on Dale Avenue and another on Western Ave. just beyond the Cut bridge. This was the design originally planned for Western Ave. When the plan was eventually scaled back to just one arch, it was thought best to locate it on Washington St.
Front and rear views of the arch. The arch was constructed of wood and covered with cloth that was painted to look as if it was made of granite. The lettering was painted to appear as if it was cut into granite. The two Thacher’s Island lighthouses on the top of the arch were illuminated with electric lights. The arch was taken down soon after the anniversary celebration. This postcard is postmarked 1913. It was printed between 1908 and 1913 by the Curt Teich postcard company in Chicago, on behalf of publisher Edwin C. McIntire of Gloucester. It was printed using a process called C.T. Photochrom, which created color prints from black and white negatives. It is fair to assume that the card is based on an 1892 photograph adapted for this purpose. This entry was posted in Uncategorized and tagged E.C. McIntire, Gloucester. Bookmark the permalink.